Lego’s “Ideas” project has already given us sets based on everything from Doctor Who to Ghostbusters to the Curiosity Rover to women in science. 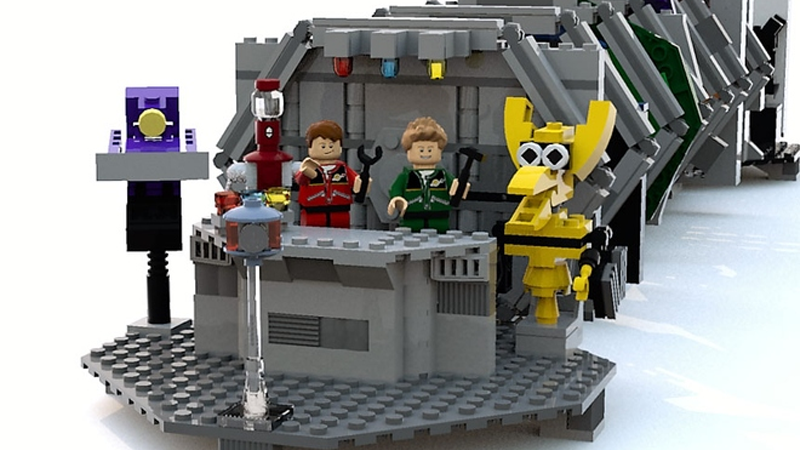 But goddammit, they should really add this Mystery Science Theater 3000 set to that growing list of awesomeness. This idea was recently submitted to Lego’s crowdsourced voting website for Lego Ideas comes from Lego user JMaster; just after a week of being on the site, it’s close to racking up 1,000 votes (a tenth of what is required for the set to be put up to Lego for review and the chance of being officially made). The planned set includes a ridiculously impressive amount of figures: hosts Joel Robinson and Mike Nelson, robots Cam-Bot, Gypsy, Tom Servo, and Crow, and even characters like Dr. Erhardt, TV’s Frank, and Professor Bobo. Aside from the figures the actual build itself is mighty impressive—a set of flat Lego-built “sets” representing the iconic doors inside the Satellite of Love, right down to the theater itself, all laid down behind each other so you can move the characters from set to set. Impressive! You can check out more pictures here.